Do You Want Guitar Lessons That Your Kids Will Enjoy And Have Fun In? Emile, our student performing guitar on a regular basis. Has Your Child been Asking About Guitar Lessons? Are you interested in guitar lessons that will inspire your children and teach them the important of effort and patience? Would you like them to gain confidence in themselves through their guitar playing? Learning guitar can be hard for children and lots of people underestimate the amount of work and tenacity a child requires to learn it. Which is why it's so important that the lessons are fun and they get on with the guitar teacher. More importantly, the guitar teacher needs to have the right philosophy regarding as guitar and music can effect so many areas of your child's life. Is this your first time looking for a guitar teacher? Or your child have had guitar lessons before? 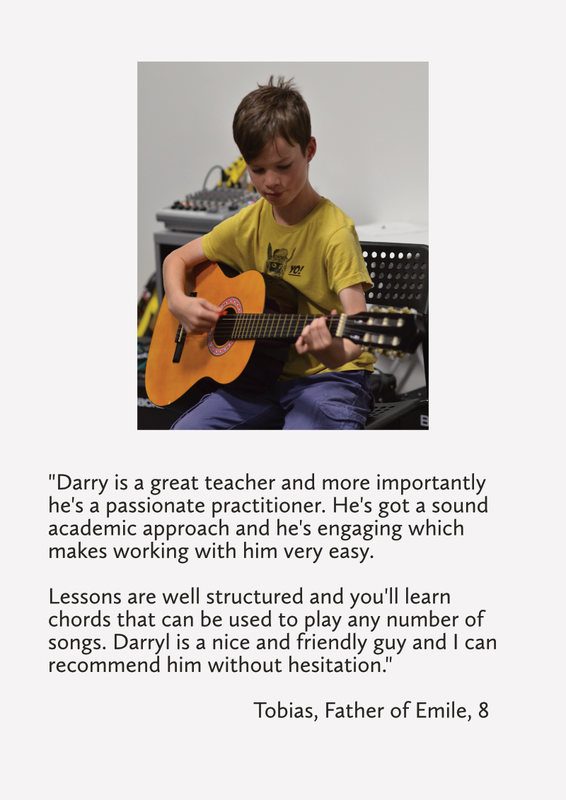 We have had a lot of experience with children with various backgrounds in guitar who have come from other guitar teachers, schools and learning along with lots of complete beginners too. The most important thing we've found is that the quality of the lessons make a dramatic difference to a child's well being and confidence in themselves. This goes beyond the surface level of guitar lessons. Having the right guitar lessons means a child has a lot of fun, makes lots of progress and feel confident with themselves. Our teaching method for them is very specific. First and foremost, your child will have fun and enjoy their lessons with us. The programs are designed to show your child that they have the ability to achieve anything they want on the guitar. This is so important for confidence building. Your child will be able to be creative and improve their ability to think through their guitar lessons with us. Your child will have the opportunity to learn skills that are often missed at school. We value the importance of developing good social skills for children. A positive and supportive environment is so important for your child's learning and development. You will have lots of communication with us so you know exactly what your child is going through, and know what they should be working on at home so that you can support them. If this sounds good so far, contact us for a free introductory guitar lesson for your child with our school. Common Questions about Our Guitar Lessons? How much are the guitar lessons? The guitar lessons and prices are based on specific programs for your child. Click on the link below to enquire about meeting us to find out more. Every child is different so our general recommended age is 8 years old. We don't have a guitar yet, is that okay? Of course, we have guitars that they can borrow when they come in. To make sure they enjoy it before they get started with lessons. What Do Our Parents and Guitar Students Say About Our Kids Guitar Lessons? Click on the button below to fill out our contact form to schedule in a free introductory lesson for you and your child. Where you can meet us, find out more about what you do. Make sure that your child is enthusiastic about guitar lessons. PS. Our new school is getting busier, get in contact to make sure you get your space for an intro lesson. We are excited to meet you and your child and find out how we can help.